Who doesn’t love a party? After all, soirees combine three things that everyone loves: Food, friends, and fun. No shindig—whether it’s a birthday, wedding, or graduation—is complete without dessert (plus decorations, tunes, and presents). For many, a cake is the ultimate celebratory symbol. Others prefer alternative confections like cookies, brownies, and fudge. And while chocolate and vanilla are classics for a reason, nothing says let the good times roll quite like Funfetti, bursting with sweetness, rainbow sprinkles, and nostalgia. Want even more flair? Deck your kaleidoscopic baked goods with florid frosting—aqua, hot pink, neon green, or purple—and an extra smattering of sprinkles. You can even add some multicolored candles or a dazzling DIY cake topper. It’s easy to see why everyone is sweet on this festive flavor. Ready to get in on the fun? Scroll on for 20 chromatic confections that your guests will gobble up with glee. Fun and festive, these sprinkle-studded sugar cookie bars are finished with a layer of buttercream frosting. Just be sure to make a second batch, because everyone is going to grab seconds. Cheesecake or brownies? Why should you have to choose? These swirled delights combine the best of both worlds. They’re rich, decadent, and totally delectable. Test your culinary, err baking, skills with this scratch-made showstopper. This oh-so-colorful confection layers piñata-flavored cake and silky vanilla buttercream. And the checkerboard design is about as adorable as it gets. Everyone needs a no-fail dessert in their recipe repertoire. 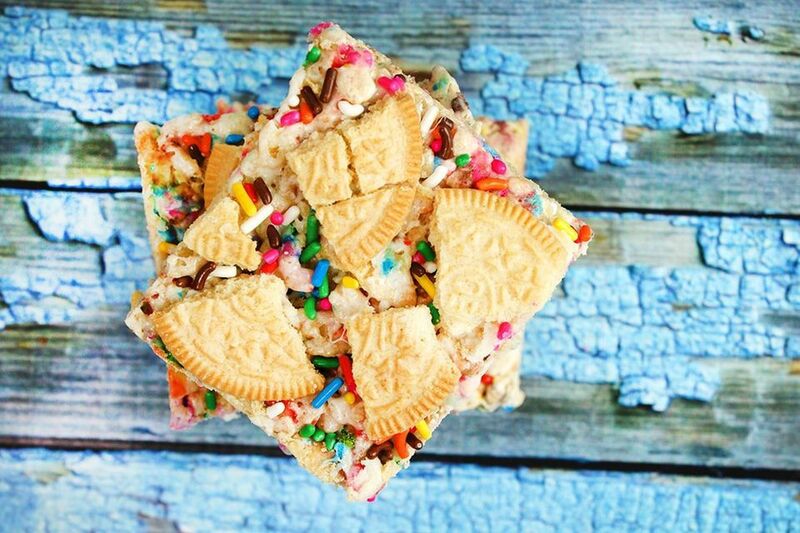 And for us, it’s these ​Funfetti Rice Krispie treats. Whip up a batch for your next party or bake sale. Light-as-air and dripping with a luscious (two-ingredient) icing, this angel food cake is super simple to make, but packs a pro-level punch when it comes to impressing your guests. For those days when you can’t decide between Oreos, chocolate chip cookies and cupcakes, this recipe delivers all the aforementioned goodness in a single chewy treat. Plus, it’s piled high with buttercream frosting. Who wouldn’t love that? Hosting an afternoon tea? Give your guests a scrumptious spin on an Italian classic with this rainbow biscotti recipe, enhanced with vanilla extract, sprinkles, and a white chocolate drizzle. Is it breakfast or dessert? We don’t care! These Funfetti cake batter waffles are the best way to start the day or end the evening. A grown-up riff on a childhood favorite—that’s still totally kid-friendly—these brown butter cookies are a total crowd-pleaser that’s sure to appeal to adults as well as younger party-goers. Craving a delicious vegan dessert? Get the soiree started with this dairy- and grain-free twist on a traditional, multi-layer Funfetti cake. Adorn with pink and yellow frosting. Double the Funfetti, double the fun. 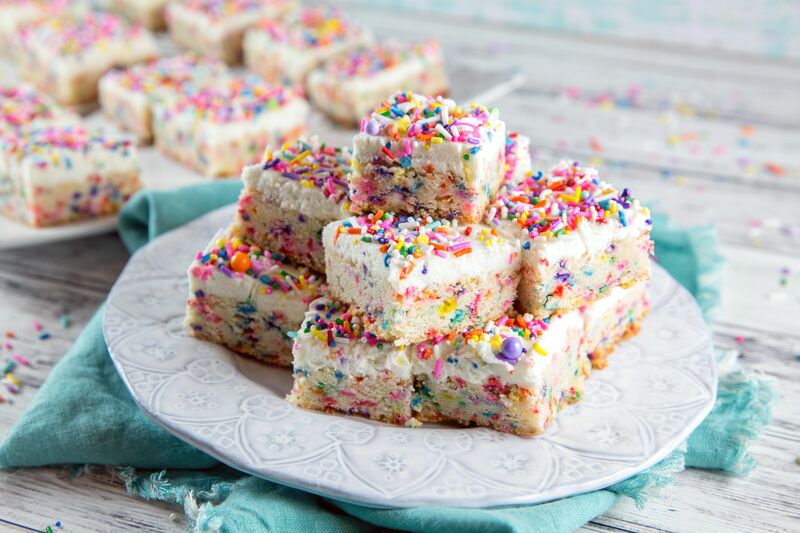 These sprinkle-speckled fudge squares are topped with birthday cake crumbles. Bonus: They double as adorable and edible favors for your next get-together. Looking for cute candy that’s as palatable as it aesthetically pleasing? These cake-flavored lollipops flecked with colorful sprinkles are pure happiness on a stick! Funfetti cookie dough sounds pretty darn delicious on its own. The addition of orange swirl ice cream and whipped topping just elevates it to a whole new level of dreaminess. Curious what makes these “slumber party” cupcakes? Funfetti pancake batter! The texture is soft and fluffy. Adding to the yumminess is a wonderful whipped frosting. Midnight snack anyone? A sweet rendition on a savory sandwich, this grilled cheese sammie stars buttery brioche, ricotta, and Funfetti cake mix. Make happy hour that much more cheerful with this cake batter-inspired cocktail. Boozy and just a bit indulgent, it’s the perfect hump day tipple. After all, you’re over halfway to the weekend. And that’s worth rejoicing, right? As addictive as they are adorable, these cute cookies are chock-full of white chocolate chips and sprinkles. Turn any day into a celebration with this sweet take on our favorite Mexican food! Finish with a dollop of frosting and rainbow sprinkles. A modern take on a nostalgic treat, these sweet squares will tantalize your taste buds with an irresistible combination of Golden Oreos, Rice Krispies, sprinkles, and marshmallow.